As the movement has become the topic of all news discussions, new and new opinions are coming in from both the party over the credibility of the bill. Is the bill really effective? The India against Corruption movement is now not only appearing in Indian media but has become an international news. Indians staying in HongKong and East Asia are protesting in their style in the respective area. An article in Wall Street Journal suggests that due to the protest in India, the government of India has diverted its attention from its regular work to the protest, causing a decline in economy. Anna Hazare stands up with an image of corruption free India in his mind, some not hesitating to call him Kalki, who is supposed to come in white clothes/horse. With youth and grace, with truth and honesty and with idea and smile, this man in his 70s could connect to the people of India, but not this government. The Jan Lokpal Bill is the stronger version of Lokpall bill (See the comparison here: Lokpal vs Janlokpal bill). Anna Hazare’s version of the bill gives more power to the public, to the autonomous bodies and less power to the government if the corrupt in the government body has been found. The bill has almost all the points from the government’s version but little enhanced and more transparent. The government’s bill is not only weak but also discourages the common public to raise a voice against the corruption for a rough example. If a person register a complaint against a government employee for corruption, Government will provide the employee a government lawyer, and all important facilities and cover, while the person who complained will have to arrange on his own for a lawyer. If the person’s claim comes out to be right then the corrupt will get a sentence of 6 months. If not, then the corrupt gets a chance of complaining against the person for false allegation under which the person might have to spend 2 years in custody. Though it is true that Anna Hazare’s bill is going to bring a lot of changes in our society, it is incapable of removing the corruption from the roots. In other words it is more like cure of the symptoms than prevention. Today politicians’ mind has become so corrupt that it is not so easy to contain the corruption through one law. There are lots of issues and problems which need to be discussed and debated to bring change in society. For a rough example, Anna Hazare’s bill gives a greater power to Lokpal committee, which will have every one, from Prime Minister to MP, under them to check corruption. This will make the organization very powerful. The problem will come if by chance one of the member of the committee comes under the grip of corruption. But we must not forget that it is the beginning of change and not the end. We will protest till the end, till everything is on the correct system. Anna Hazare has shown us the goal and the way. Now it is our duty to do our part, help him achieve his dream. It is just the beginning. We don’t have to sit silent even if the bill is accepted. We have to keep an eye and see if the government doesn’t cheat us again. Time To Bid Farewell To Anna Hazare And Carry The Revolution Forward! 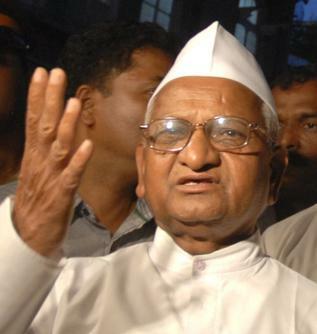 Is Anna another Gandhi? Should such labels matter for a national campaign? Can We Afford Another Unquestionable Mahatma?